Easy recipes for basic and Italian meatballs baked in the oven. Plus an awesome tip for portioning them out to be the same size. We eat meatballs all the time! Like, ALL THE TIME. I add them to spaghetti sauce, make meatball subs, bake them with sauce and mozzarella, make Swedish meatballs, slice them then layer in lasagna, heat them with marinara in a crock pot to serve as an appetizer or just serve them as-is! But I really don’t like those prepared frozen meatballs. They have the consistency and texture of cork and a dreadful artificial flavor. That being said, they are awfully convenient and inexpensive so they’re tempting to use! Instead of buying the frozen ones, I make huge batches of homemade meatballs then freeze them in gallon-sized zip-top bags for easy use. It’s not expensive to make meatballs but it can be time consuming. And that’s why I figured out a super easy way to make them. Holla! I mix up the ingredients then turn the mixture out onto a cutting board then shape into a rectangle. Once I have a perfectly shaped slab of meatball mixture, I then cut the slab into cubes then roll each cube into perfectly portioned, same-size meatballs. I like to make both basic and Italian meatballs (depending on what I'm using them in) and have both recipes listed below (just a few minor tweaks between the two). I know the traditional way to cook meatballs is to pan-fry them in a little oil but I like to bake mine! For one thing, I don't have to stand over the stove and get covered in grease while I cook them but also because baking them is so quick and easy! I have a huge sheet pan that I can fit a triple batch on and that's usually how many I cook at a time. Like I said above, I throw them in a freezer bag then pull them out as needed for quick suppers or appetizers. In a medium bowl combine onion, egg, worcestershire sauce, parmesan cheese, dried parsley or Italian Seasoning (depending on which recipe you're using), salt, pepper and garlic powder; mix well. Crumble ground beef into mixture then mix with your hands until just combined. Don’t “squeeze” the mixture with your hands – overworking the meat is what yields that “corky” texture. Add bread crumbs then continue to mix the ingredients until everything is just combined. Turn mixture out onto a cutting board or clean counter and shape into a rectangle. Pat her down good and keep working on it until it’s perfectly shaped. 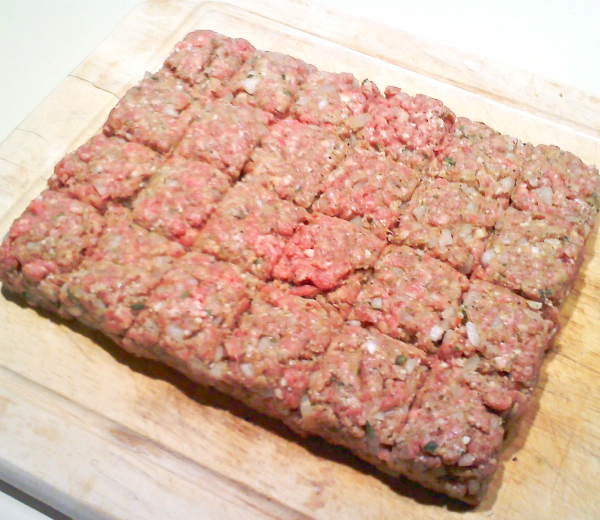 Using a sharp knife, cut the mixture into 24 squares (or less if you like bigger meatballs). Roll each square into a ball. Line a baking sheet with aluminum foil (for easy clean-up) and spray with cooking spray. 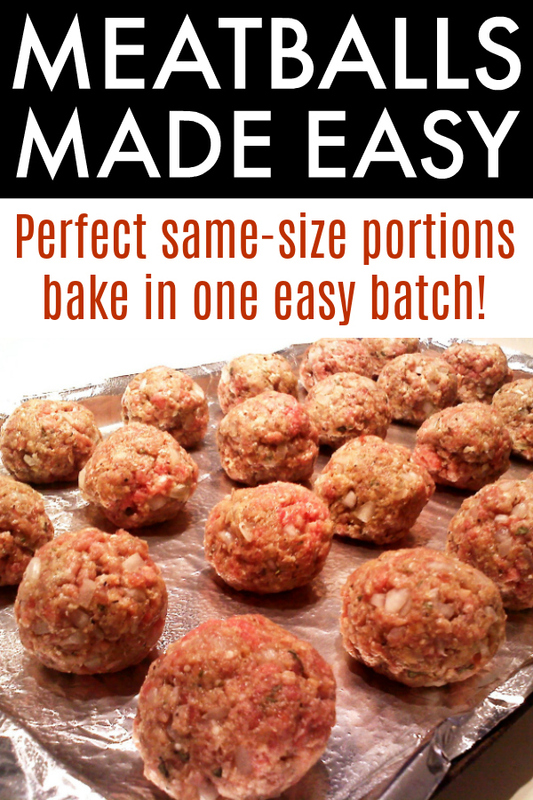 Place meatballs onto baking sheet and bake at 400 degrees for 18-20 minutes. That rectangle trick is brilliant. Thanks for sharing! PS, I just "pinned" this recipe, too! That's AMAZEBALLS! Thanks for pinning it! This is SO good! I used ground turkey (trying to be a little healthier) and I browned them in my cast iron skillet in olive oil for a few seconds before I put them in the oven. Then I cut out some of the oven time! Definitely making this again...thanks for sharing! Wow, Ali... I only just now seeing this! Thank you for your comment and I'm so glad you liked the recipe! My Mom's secret to great meatballs. Broil the meatballs about 10 minutes & turn & cook another 10 minutes. If you make homemade spaghetti sauce, turn the heat down to a slow simmer, add the meatballs, and allow them to cook in the sauce for about 3 hours. They are the most delicious meatballs you will ever have!! I made these and thought it looked like a lot of pepper when I mixed them up...I made a double recipe and only used 1/2 the pepper. Glad I did, they were too hot for me (I'm a bit of a wimp), but my husband loved them! I browned them in a skillet with a little olive oil and put them in the crockpot with some BBQ sauce....cut down on the heat in this darned hot weather. I will definitely make them again, just cut down on the pepper. I love the idea for cutting them. They were all the same size,no hassle. Thank you for sharing!!! I'm going to be trying these tonight when I make spaghetti for dinner. My dad requested meatballs and I've never made them, but these look pretty simple. It will make a lot more than we will eat, so I was wondering if I can freeze them once they are cooked? Then I could just pull them out another time and reheat. Would that work? Thanks! I'm really looking forward to trying these!! Absolutely! I make huge batches and freeze them. 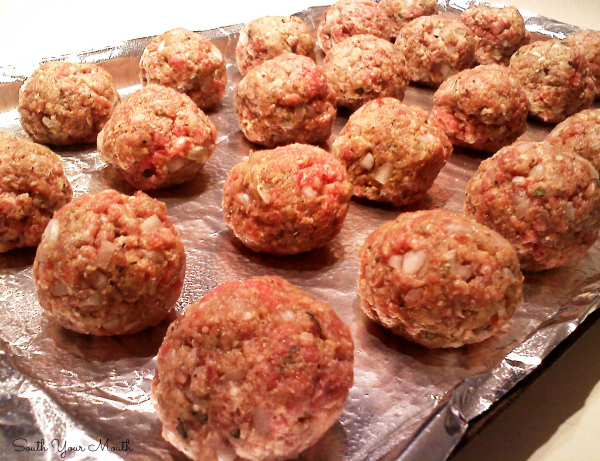 Once cooked, let the meatballs cool completely then place in a large zip-top freezer bag. I pop a few into jarred spaghetti sauce when I'm heating it and then by the time the pasta is done, I've got spaghetti & meatballs. I hope you dad likes them! Made a large batch of these today and served them with spaghetti tonight! Oh love! Family went nuts over them~making another batch tomorrow to freeze. Thank you so much! You just made my day! I'm so glad everyone liked them. Thank you so much for letting me know! When I made mine I grated a couple cloves of fresh garlic into the mixture. Tasted great. Thanks for sharing your secret for quickly making them the same size. Maybe I'm blind and just missed it but how much Westchester does the recipe call for? Thanks! Whoa... so weird! The measurement was missing?! I was in this a few days ago and maybe I accidentally deleted it (???). I've read over it to make sure nothing else was missing and I don't think so. Thanks for asking! I just found your site and I've already printed 3 cake recipes for my family reunion this summer [if I can wait that long. ]and the one with sausage and rice to try very soon. When I make meatballs I boil them instead of fry or bake them. I love your site and plan to visit often. Hey Mandy! Going to do these homemade meatballs at some point. Now that I am retired I may start cooking a little more..maybe even "ride a bike". Love your blog and your recipes! I made the italian meatballs for my family last night, and they were gone before bed. SO good, thank you! I made these today, they were freaking fantastic!